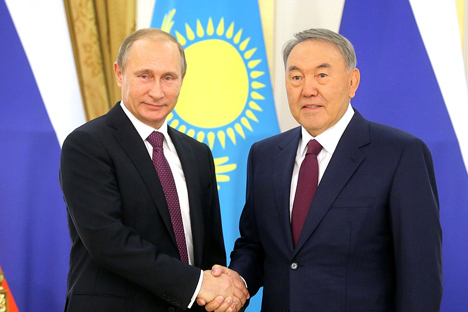 Vladimir Putin and Nursultan Nazarbayev. Presidents of Russia and Kazakhstan Vladimir Putin and Nursultan Nazarbayev have signed a protocol which introduces some changes to the agreement on the delimitation of the seabed in the northern part of the Caspian Sea to execute the sovereign rights for the subsoil use as of July 6, 1998. Russian presidential aide Yuri Ushakov earlier told reporters that this document regulates the issues of the joint development of the Tsentralnaya oil-bearing structure. It was reported the document envisions the introduction of some changes to the Russian-Kazakh agreement on the delimitation of the seabed of the Caspian Sea's northern part. This protocol has been drafted since the mid-2014. Its signing will allow the Russian government to acquire a license for geological prospecting and the production of oil and gas at the Tsentralnoye field on the Caspian Sea shelf. The license is expected to be issued without a tender and a contest for 25 years, with a period of geological mineral resource exploration of up to seven years. The Tsentralnaya structure is located in the Russian waters of the Caspian Sea, 180 kilometers east of Makhachkala. In May 2008, an oil and gas condensate deposit with 169.1 million tonnes of fuel reserves was discovered there.